I have found the best ways to interact with neighbors all center around food. For example, when I was really little we lived on the bottom floor and my cousins lived right above us in a duplex. Apparently, as a robust three-year-old, I would eat dinner at home and then go upstairs for round two. Very convenient. Also good to know old habits die hard. Oh, and once, in a fit of panic, I went around and knocked on all 3 doors of my old building to see if anyone, legit, had a half cup of milk for a cake I was baking. The dingy downstairs boys indeed did, and, after enduring a brief jam session I was invited to witness, were rewarded with cake the next day. In my new place, the basement of a brownstone with a family living upstairs, surprise shirtless visitors will be few and far between (I hope) (unless its a toddler). BUT we do share a corridor with the family and at in impromptu hallway meetup the other morning, our new neighbor asked if we were cooking something incredible last night. Yes, yes we were. It was cabbage. And onions. And it smelled like you were transported to the homiest of loving homes in Delhi and sat down for a legitimate feast. Onions, cumin, ginger, and turmeric. The humblest of ingredients create the most irresistible wafting aromas. Oh! And! My old roommate found the cookbook this recipe came from on this side of the street and thought I’d like it. Full Circle. Heat 4 T oil over high heat in a very large pan. 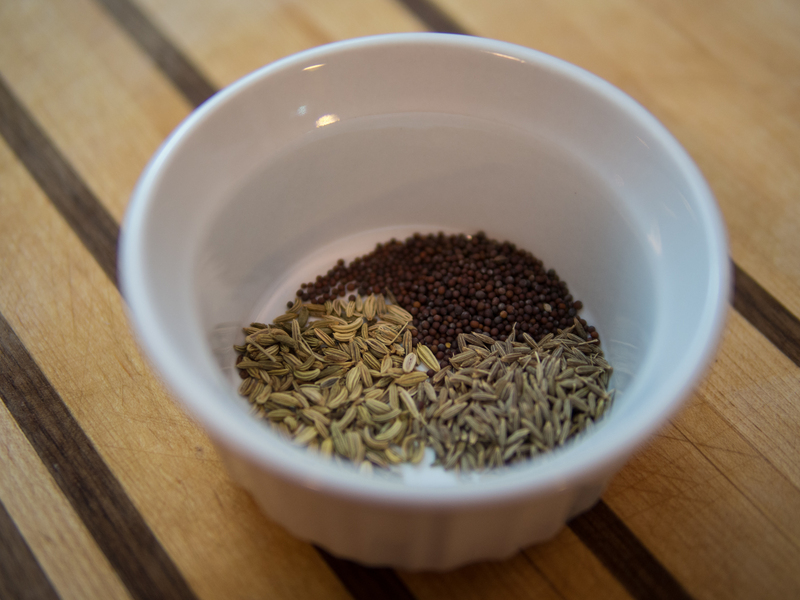 Add cumin, fennel, and mustard seeds. 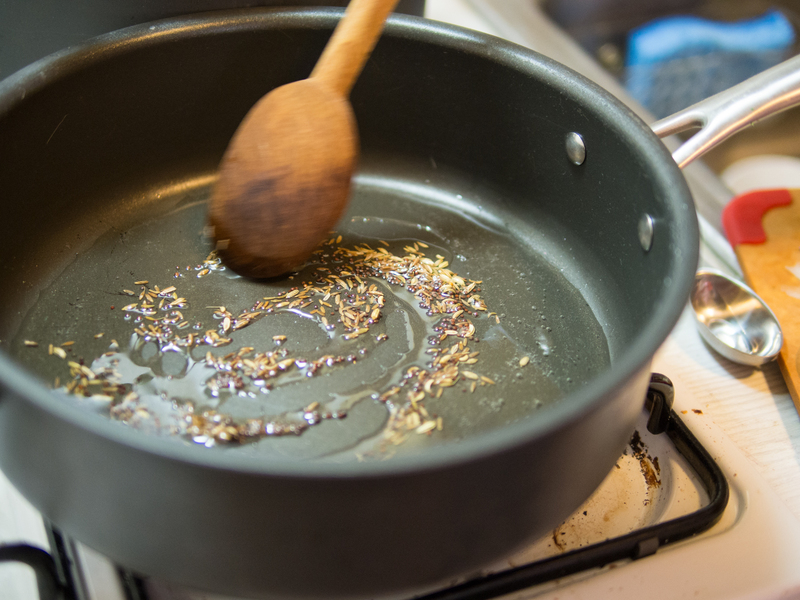 Stir frequently for about 30 seconds to a minute, until mustard seeds start to pop. 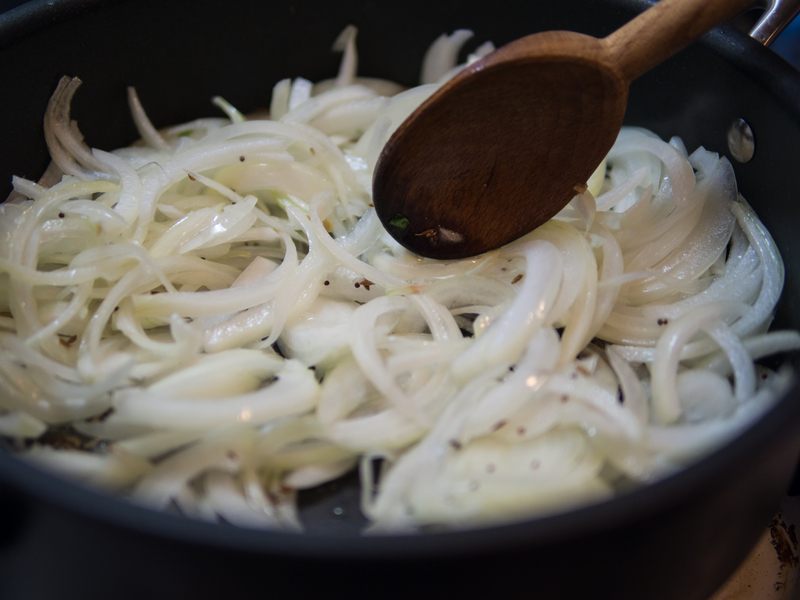 Turn heat to medium and add one and a half onions, sliced (save the last half onion for later.) Cook for 5 minutes. Next, add cabbage, collards leaves, and celery leaves. 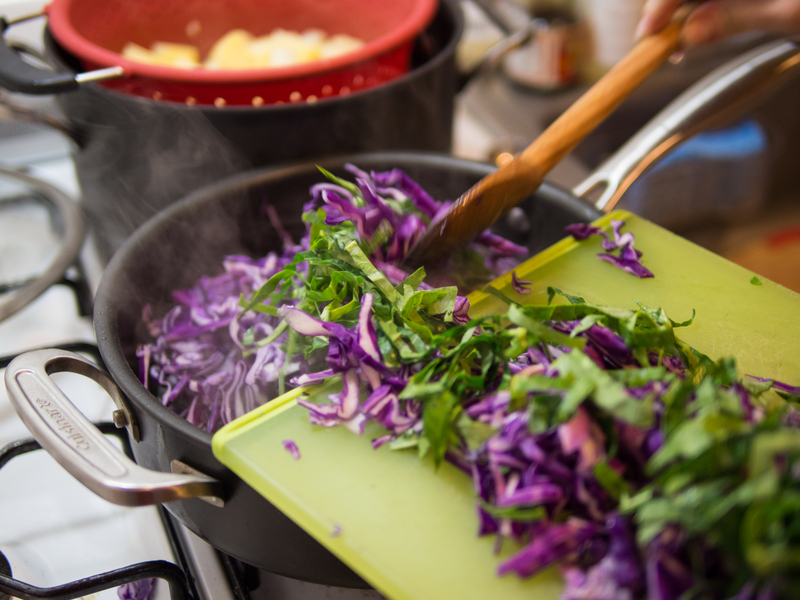 It will seem like there is WAY too much cabbage but stir lovingly and be patient, and cabbage will wilt astonishingly. 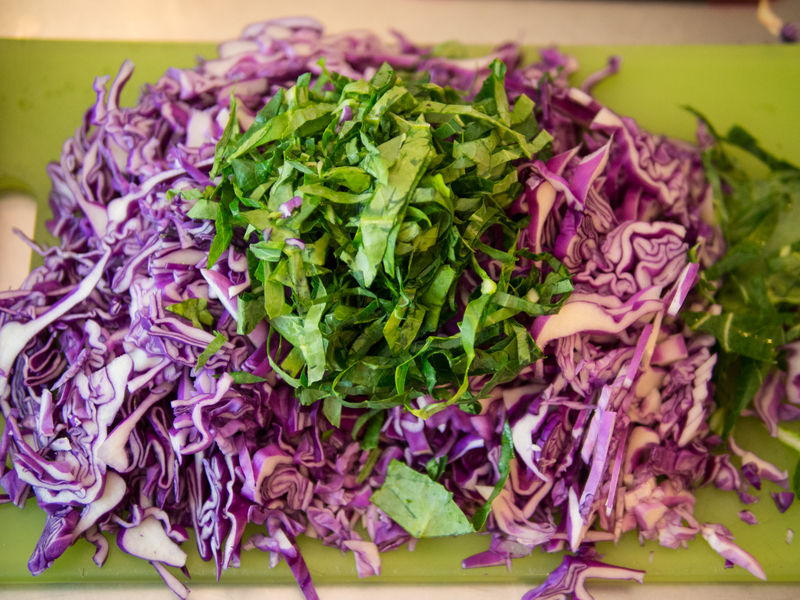 Don’t be afraid to sacrfice a couple cabbage strands in the process. Cover, turn to low, and cook for 15 minutes. After this, take off the cover and cook for another half an hour. 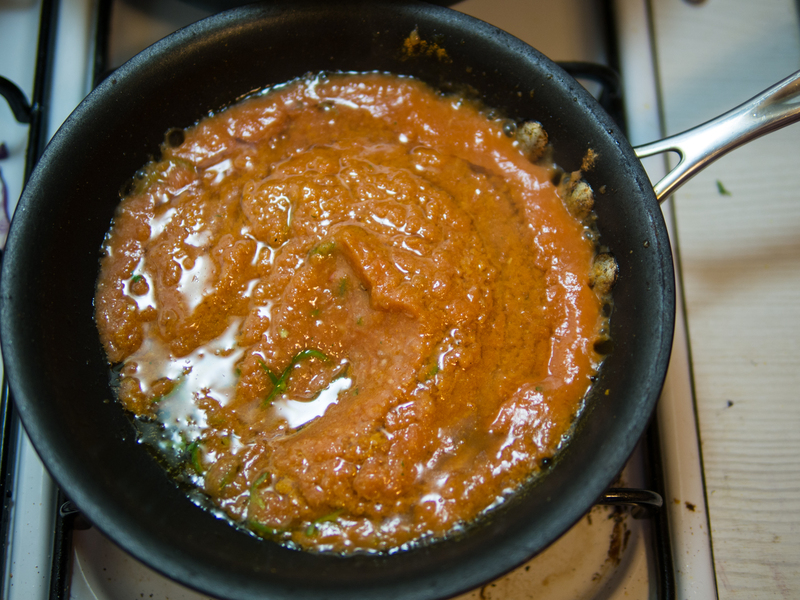 Meanwhile, blend canned tomatoes + their juices, ginger, garlic, and the reserved half onion using an immersion blender (or a legit one). Heat 3 T oil in a small skillet on high heat. Add blendered spice paste, spicy pepper slices, and turmeric. Cook for 8-10 minutes, stirring constantly, until thickened and your neighbor texts to ask if they can come over for dinner. 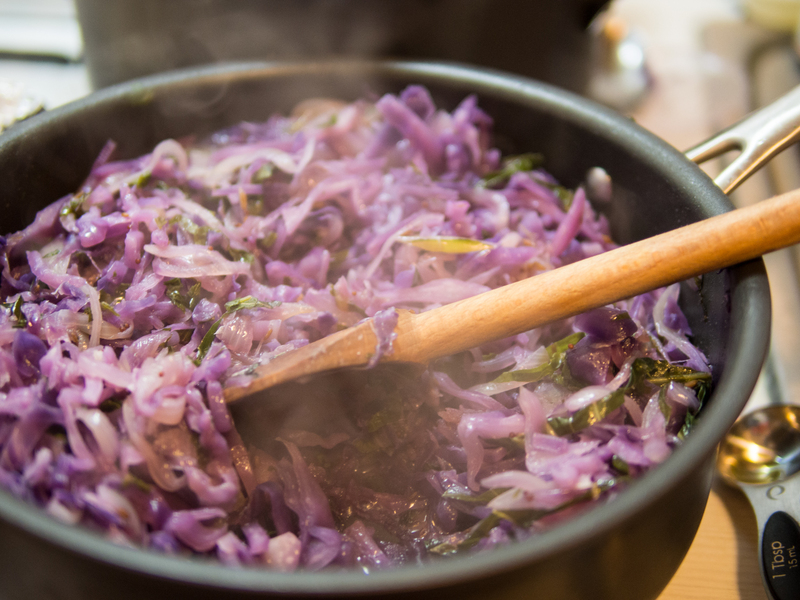 Once cabbage has cooked for 30 minutes, add thickened spice paste, lemon juice, salt, and garam masala. Stir together well and cook for an additional five minutes to let flavors meld. 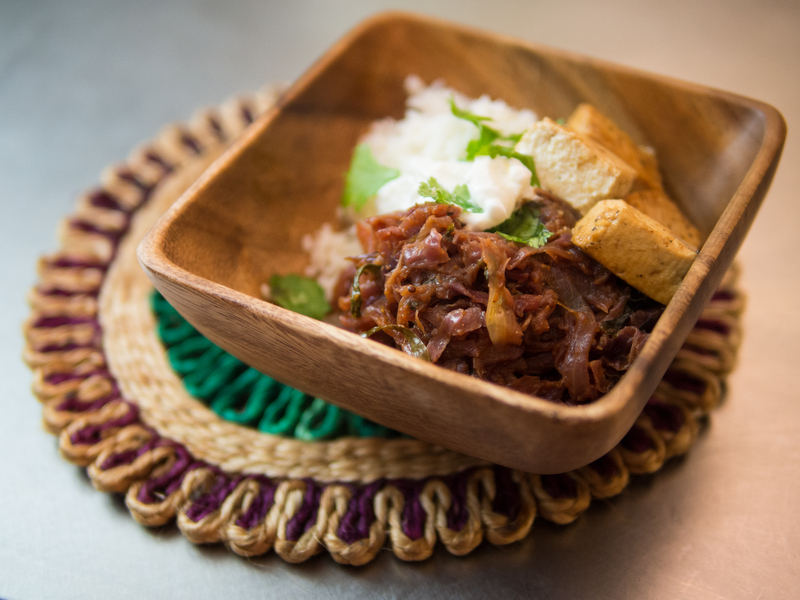 Spoon over rice, add a dollop of yogurt, and enjoy! I added some quick pan-fried tofu just to make it more of a complete meal, but it was totally unnecessary. Leftovers were AMAZING. This entry was tagged cabbage, csa, dinner, gluten free, Indian, onions, recipe, vegan, vegetarian. Bookmark the permalink.